A Delhi man has been arrested for breaking into several vehicles – one of which he stole and left burning on the side of the road. 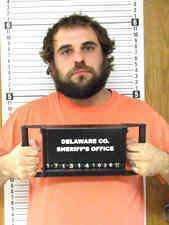 The Delaware County Sheriff’s office says 26-year old Tyler Sternhagen has been taken into custody. The Sheriff’s Office had responded to a call last Wednesday in Delhi, where several cars had been broken into. While responding to the call, a deputy spotted a fire along Highway 20 and noticed it was a vehicle sitting under the overpass in Delaware. Authorities discovered the burning vehicle had been stolen from the same lot where the other cars had been broken into. Following an investigation, Sternhagen was arrested and charged with Second Degree Arson and Second Degree Theft, as well as four counts of Third Degree Burglary, three counts of Fifth Degree Theft and two counts of Second Degree Criminal Mischief.